I grew up with a mother with a big personality...let's call it that to make it seem less obnoxious. I inherited some of those traits. I have been told I am a lot like her just not mean. I hope that I am not although I know I can be. Through all of her craziness, one of the things she gave me was a love of music. Many a weekend was spent with music blasting loudly in the living room, dancing and singing along. It was fun and glorious for a young girl. My grandmother also loved music. She had perfect pitch and I used to love standing next to her in church, her perfect soprano voice lilting through the air. I would try to harmonize with her with my alto voice making beautiful music together. In high school my grandparents paid for me to have voice lessons, increasing my confidence to sing out loud. These lessons helped me to find the confidence to try out for solos and eventually sing in the state solo competition. When I was selected for Choralaires, I was signing up for solo nights and competitions, the sporting events for music kids. We did a lot of them. It seemed like we traveled to every competition around Oregon and Washington, but I have to say....we were really good! We won a lot and had a ton of opportunities to have fun. Music is something special. It speaks to the soul. Think about times when you were sad, a song probably said all you were feeling. When you were in love, the lyrics of a song could speak to you. Do you want to dance? Cry? Sleep? Each of these had music associated with it. Music has healing powers, the ability to bring joy to your heart, a way to share how you feel with a friend. 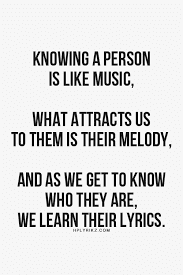 If you really want to know someone, listen to the music they like. It will tell their story. Be willing to look at it all because each note, each work, reveals a piece of their heart.